Beach Picnic. July 11, 1939. Engraving. Sasowsky catalog 182 tateiii. 5 x 7 (sheet 7 1/2 x 10). Edition 20. Printed on china paper affixed to a sturdy white wove support sheet. A rich impression of this very rare image. Signed in pencil. Housed in a 16 x 20-inch archival mat, suitable for your choice of frame. 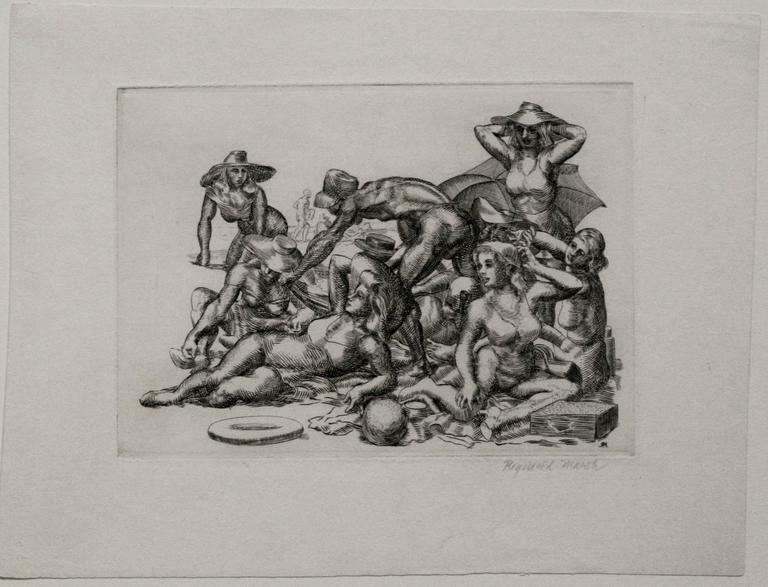 Reginald Marsh was born in 1898 in Paris, but he grew up in New Jersey. He graduated from Yale in 1920 and continued his studies at the Art Students League in New York under John Sloan, Kenneth Miller Hayes and George Luks. Marsh supported himself throughout the 1920s, working as an illustrator for The New York Daily News, Harper’s Bazaar and several other periodicals. From 1922 to 1925, he produced more than 4,000 illustrations for the Daily News alone. 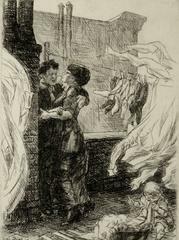 Marsh is known for having used contemporary subject matter to depict urban life with all its tawdry aspects. His fascination with the human crowd is best exemplified in his portrayals of Coney Island Beach and his crowded subways, burlesque scenes and Bowery bums. Though he is sometimes defined as a second generation Ashcan School artist, Marsh is best remembered and admired for his Depression-era work. His first one-man show took place at the Whitney Studio Club in 1924 and the following year, he joined the staff of the New Yorker, to which he contributed regularly until 1931. Reginald Marsh died in Dorset, Vermont in 1954.